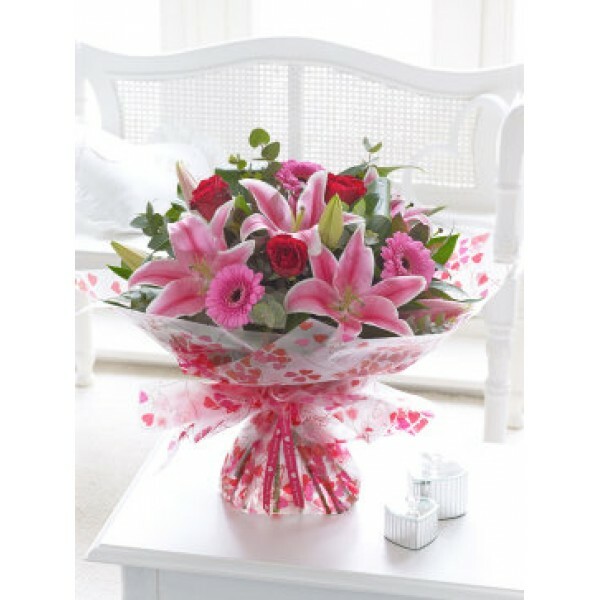 Roses and lilies are always a favourite combination, and there is no exception for Valentine’s Day. We’ve combined romantic red roses with feminine pink lilies and pretty pink germini to create a beautiful gift for your special someone. Featuring red large-headed roses, pink Oriental lilies and pink germini with folded aspidistra leaves, eucalyptus, purple dracaena and salal, presented in Valentine’s Day gift wrap and trimmed with a ‘Be My Valentine’ cotton ribbon.